That’s right! 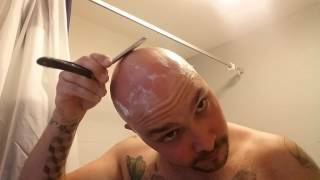 a new Straight Razor Project is coming to TheBaldNation.Com, Craig Berrington a fine fellow and #Brotherinbald has kindly shot a video demonstrating the art of Straight Razor shaving for his Dome and face. Craig is a VBlogger for the UK Wet Shaving Blog. You can find all his fantastic videos here! Craig Berrington VBlogger for UK Wet Shaving Blog with fantastic Straight Razor shave talking about TheBaldNation.Com Straight Razor Project. Check out all his videos and let him know just how fantastic this guy really is! Watch for me new Straight Razor Blade project and a new corner made especially for Craig called Craig’s corner.